Chelsea striker Diego Costa has been accused of violent conduct by the Football Association after his side’s 2-0 win over Arsenal on Saturday. 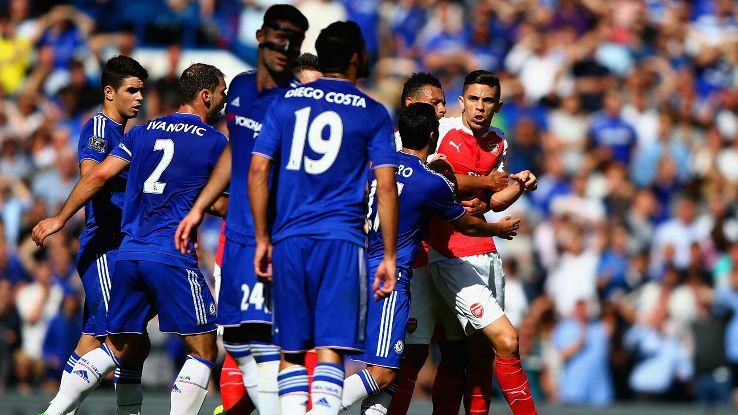 Chelsea’s 2-0 win over Arsenal at Stamford Bridge on Saturday ended in Bad blood. When the term misconduct comes into play the first name that pops in everybody’s head among Chelsea’s players is Diego Costa. Keeping up his retro image he is recently being trapped in new controversy. He is confronting up to the possibility of a three-match ban after the Football Association charged him and Gabriel Paulista and in addition Chelsea and Arsenal for failing to control their players. The Spain international clashed with Arsenal’s Laurent Koscielny and Gabriel in the first half. He was cited for lashing out at Arsenal’s Laurent Koscielny yet escapes sanction for Gabriel scratch. 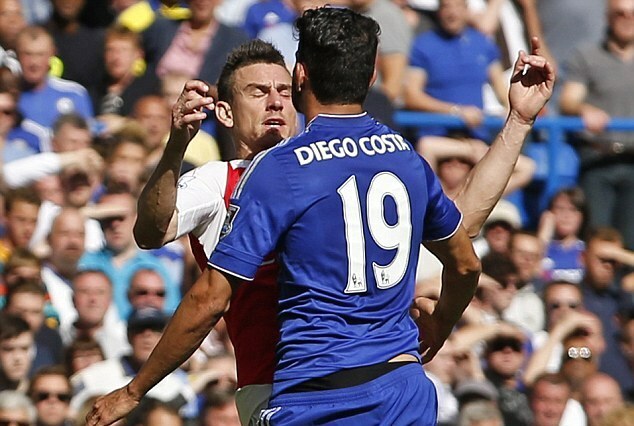 Costa seemed to begin the episode by twice raking his hands over Koscielny’s face and afterward chest-bumping knocking him to the ground. Gabriel then came over to defend his teammate, and he and Costa both received yellow cards following their confrontation. 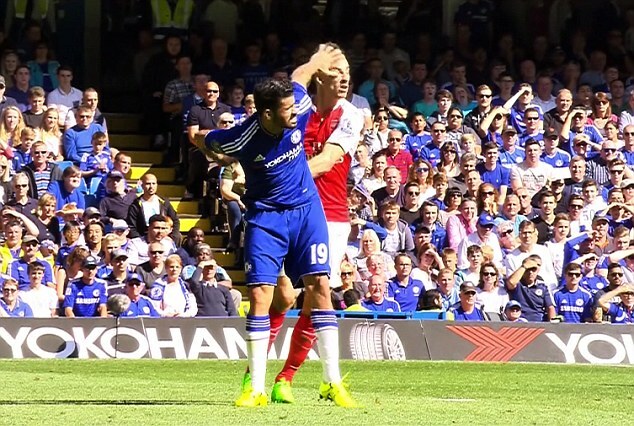 But a minute later the Arsenal centre-back was sent off for flicking a boot at the Blues forward. Having confirmed the match officials did not see the clash between Costa and Gabriel which could have called for an instant red card to Costa the FA supplied video footage to a panel of three former elite referees. They each needed to autonomously govern Costa’s activities to be an instant red card for the FA to continue with the charge. A statement on the FA’s official website read on Monday: “Diego Costa has been charged for an alleged act of violent conduct which was not seen by the match officials but caught on video. “The Chelsea forward was involved in an incident with Arsenal’s Laurent Koscielny in the 43rd minute of the game. He has until 18.00 BST tomorrow (Tuesday Sept. 22) to reply. “Arsenal defender Gabriel has been charged with improper conduct for his behaviour following his dismissal, whilst teammate Santi Cazorla has been warned for his behaviour following his sending off. I enjoy you because of all your labor on this website. My aunt really loves engaging in research and it is easy to see why. My partner and i learn all relating to the powerful medium you convey invaluable items via your website and in addition foster response from website visitors on the area of interest plus my simple princess is actually becoming educated a lot. Take pleasure in the remaining portion of the new year. You are doing a great job.